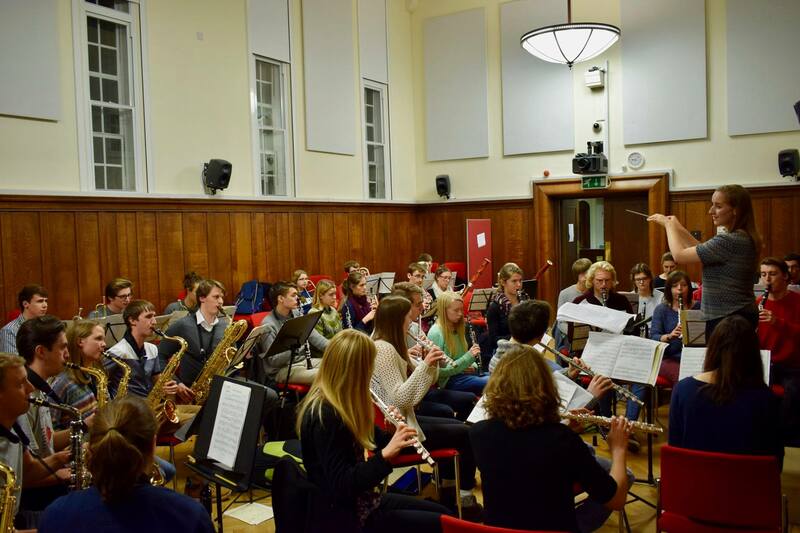 Founded in 1974, Oxford University Wind Orchestra (OUWO) is the university’s premier wind ensemble, with membership by audition. The ensemble performs a wide variety of repertoire, focusing particularly on original works for wind ensemble by contemporary composers such as Martin Ellerby, Frank Ticheli, Eric Whitacre, and John Mackey. In addition to termly concerts in Oxford, the ensemble performs an annual Varsity concert with Cambridge University Wind Orchestra. Over the last 12 months the orchestra has grown and now has 56 talented and committed musicians and its concerts are regularly sold out. The dedication, energy, and enthusiasm of each individual member has led to a year of exceptional music-making, the programming of exciting and challenging repertoire, and a remarkable personal and musical bond within the orchestra. After hearing of our success, the wind orchestra’s founding conductor, world-renowned conductor and composer Colin Touchin, has offered to write a brand new work, which will be premiered at our forthcoming concert on Saturday 16th November, University Church of St Mary the Virgin. We believe the past year has proven that the ensemble is now in a position to take on new and innovative projects. As a result, we have decided to arrange a 10 day ground-breaking and collaborative tour to the East Coast of the USA. 1. Provide all members the unique opportunity to perform in the USA, the world leader in wind ensemble performance. 2. Provide opportunities to share and learn from joint concerts with leading university wind orchestras along the East Coast of the USA. 3. Forge meaningful, lasting musical and social relationships with our colleagues in the USA, and act as a template for an exchange programme by the Oxford University Music Society with participating universities. 4. Demonstrate, through musical collaboration, the power world-leading universities possess to act as beacons of international unity at a time of political unrest. Repertoire will showcase original works for wind ensemble by contemporary composers from both the UK and the USA. follow these links to see us in action! As an ensemble we have been working hard to raise the funds to make this tour happen. Already we have busked, made and sold cakes and a group of us will be completing the Oxford half-marathon in October! We still have some way to go and need your help. Please donate on this page and help us achieve our target. Please share this incredibly exciting, significant and important project with friends and family. Keep up to date with the orchestra by ‘liking’ our page on Facebook!